Mit großer Spannung erwartet die Pokerwelt den Saisonstart der Gobal Poker League. Heute um 18.00 Uhr ist es endlich soweit, dann beginnen die ersten 6-Max Matches der Saison, die live über Twitch mitverfolgt werden können. Für Mittwoch und Donnerstag stehen dann die ersten Heads-Up Partien auf dem Programm. Interessant sicherlich aus deutscher Sicht ist das Heads-Up Aufeinandertreffen am Mittwoch zwischen Berlin und Paris. Anpfiff für dieses Match ist 20.30 Uhr. Die reguläre Saison läuft vom 05. April bis 22. September. Gespielt wird jeweils an drei Tagen in der Woche, Dienstag, Mittwoch und Donnerstag. Hinzu kommt die GPL „Summer Series“, die vom 06. Juni bis 08. Juli in einem GPL eigenen Studio in Las Vegas gespielt werden. Kurz nach der reulären Saison starten die Playoffs (30. Sep – 01. Okt), gefolgt von den Finals im weltberühmten Wembley Stadion am 22. und 23. November. April 5 6-Max Online Eurasia Conf. 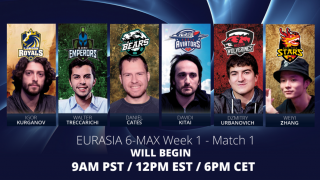 6 p.m.
6-Max Online Eurasia Conf. 7:40 p.m.
6-Max Online Americas Conf. 9:30 p.m.
6-Max Online Americas Conf. 11:10 p.m.
April 6 Heads-Up Online Hong Kong vs. Moskow 6 p.m.
Heads-Up Online Berlin vs. Paris 8:30 p.m.
Heads-Up Online Rome vs. London 11 p.m.
April 7 Heads-Up Online Los Angeles vs. Sao Paulo 7 p.m.
Heads-Up Online Montreal vs. San Francisco 9:30 p.m.
Heads-Up Online New York vs. Las Vegas 12 p.m.
April 12 6-Max Online Eurasia Conf. 6 p.m.
April 13 Heads-Up Online London vs. Kong Kong 6 p.m.
Heads-Up Online Paris vs. Rome 8:30 p.m.
Heads-Up Online Moscow vs. Berlin 11 p.m.
April 14 Heads-Up Online Sao Paulo vs. Montreal 7 p.m.
Heads-Up Online San Francisco vs. New York 9:30 p.m.
Heads-Up Online Las Vegas vs. Los Angeles 12 a.m.
April 19 6-Max Online Eurasia Conf. 6 p.m.
April 20 Heads-Up Online Berlin vs. Hong Kong 6 p.m.
Heads-Up Online London vs. Paris 2:30 p.m.
Heads-Up Online Rome vs. Moscow 5 p.m.
April 21 Heads-Up Online Sao Paulo vs. Las Vegas 7 p.m.
Heads-Up Online Los Angeles vs. San Francisco 9:30 p.m.
Heads-Up Online New York vs. Montreal 6 p.m.
April 26 6-Max Online Eurasia Conf. 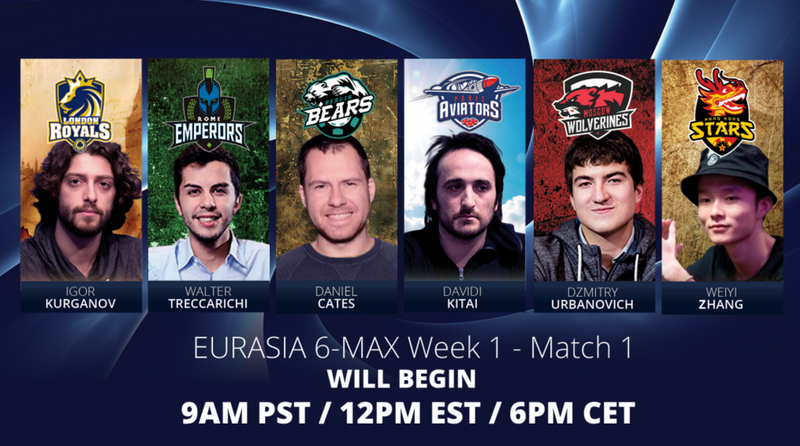 6 p.m.
6-Max Online Eurasia Conf. 1:40 p.m.
6-Max Online Americas Conf. 3:30 p.m.
6-Max Online Americas Conf. 5:10 p.m.
April 27 Heads-Up Online Paris vs. Hong Kong 6 p.m.
Heads-Up Online Moscow vs. London 8:30 p.m.
Heads-Up Online Rome vs. Berlin 5 p.m.
April 28 Heads-Up Online San Francisco vs. Sao Paulo 7 p.m.
Heads-Up Online Los Angeles vs. New York 9:30 p.m.
Heads-Up Online Las Vegas vs. Montreal 12 a.m.
May 3 6-Max Online Eurasia Conf. 6 p.m.
May 4 Heads-Up Online Hong Kong vs. Rome 6 p.m.
Heads-Up Online Berlin vs. London 8:30 p.m.
Heads-Up Online Paris vs. Moscow 11 p.m.
Heads-Up Online Montreal vs. Los Angeles 9:30 p.m.
Heads-Up Online Las Vegas vs. San Francisco 12 a.m.
May 10 6-Max Online Eurasia Conf. 6 p.m.
May 11 Heads-Up Online Hong Kong vs. London 6 p.m.
Heads-Up Online Berlin vs. Moscow 8:30 p.m.
Heads-Up Online Rome vs. Paris 11 p.m.
May 12 Heads-Up Online New York vs. San Francisco 7 p.m.
Heads-Up Online Montreal vs. Sao Paulo 9:30 p.m.
Heads-Up Online Los Angeles vs. Las Vegas 12 a.m.
May 17 6-Max Online Eurasia Conf. 6 p.m.
May 18 Heads-Up Online Moscow vs. Hong Kong 6 p.m.
Heads-Up Online London vs. Rome 8:30 p.m.
Heads-Up Online Paris vs. Berlin 11 p.m.
May 19 Heads-Up Online Las Vegas vs. New York 7 p.m.
Heads-Up Online Sao Paulo vs. Los Angeles 9:30 p.m.
Heads-Up Online San Francisco vs. Montreal 12 a.m.
May 24 6-Max Online Eurasia Conf. 6 p.m.
May 25 Heads-Up Online Hong Kong vs. Paris 6 p.m.
Heads-Up Online London vs. Moscow 8:30 p.m.
Heads-Up Online Berlin vs. Rome 11 p.m.
May 26 Heads-Up Online Sao Paulo vs. San Francisco 7 p.m.
Heads-Up Online Montreal vs. Las Vegas 9:30 p.m.
Heads-Up Online New York vs. Los Angeles 12 a.m.
June 6 Heads-Up Vegas Paris vs. Los Angeles 8 p.m.
June 7 Heads-Up Vegas Moscow vs. San Francisco 8 p.m.
June 8 Heads-Up Vegas London vs. Las Vegas 8 p.m.
June 9 Heads-Up Vegas Hong Kong vs. Montreal 8 p.m.
June 10 Heads-Up Vegas Berlin vs. Sao Paulo 8 p.m.
June 11 Heads-Up Vegas Rome vs. New York 8 p.m.
June 12 Heads-Up Vegas Las Vegas vs. Paris 8 p.m.
June 13 Heads-Up Vegas Montreal vs. Moscow 8 p.m.
June 14 Heads-Up Vegas Sao Paulo vs. London 8 p.m.
June 15 Heads-Up Vegas New York vs. Hong Kong 8 p.m.
June 16 Heads-Up Vegas Los Angeles vs. Berlin 8 p.m.
June 17 Heads-Up Vegas San Francisco vs. Rome 8 p.m.
June 17 Heads-Up Vegas Moscow vs. Las Vegas 10:30 p.m.
June 18 Heads-Up Vegas Berlin vs. New York 8 p.m.
June 19 Heads-Up Vegas London vs. Montreal 8 p.m.
June 19 Heads-Up Vegas Hong Kong vs. Sao Paulo 10:30 p.m.
June 20 Heads-Up Vegas Rome vs. Los Angeles 8 p.m.
June 21 Heads-Up Vegas Paris vs. San Francisco 8 p.m.
June 22 Heads-Up Vegas New York vs. Moscow 8 p.m.
June 23 Heads-Up Vegas Los Angeles vs. London 8 p.m.
June 24 Heads-Up Vegas San Francisco vs. Hong Kong 8 p.m.
June 25 Heads-Up Vegas Las Vegas vs. Berlin 8 p.m.
June 26 Heads-Up Vegas Montreal vs. Rome 8 p.m.
June 26 Heads-Up Vegas Sao Paulo vs. Paris 10:30 p.m.
June 27 Heads-Up Vegas Berlin vs. San Francisco 8 p.m.
June 28 Heads-Up Vegas London vs. New York 8 p.m.
June 29 Heads-Up Vegas Rome vs Las Vegas 8 p.m.
June 30 Heads-Up Vegas Paris vs. Montreal 8 p.m.
July 1 Heads-Up Vegas Moscow vs. Sao Paulo 8 p.m.
July 2 Heads-Up Vegas Hong Kong vs Los Angeles 8 p.m.
July 3 Heads-Up Vegas Montreal vs. Berlin 8 p.m.
July 4 Heads-Up Vegas Sao Paulo vs. Rome 8 p.m.
July 5 Heads-Up Vegas Las Vegas vs. Hong Kong 8 p.m.
July 6 Heads-Up Vegas Los Angeles vs. Moscow 8 p.m.
July 7 Heads-Up Vegas New York vs. Paris 8 p.m.
July 8 Heads-Up Vegas San Francisco vs. London 8 p.m.
Aug. 16 6-Max Online Eurasia Conf. 6 p.m.
Aug. 17 Heads-Up Online Rome vs. Hong Kong 6 p.m.
Heads-Up Online Moscow vs. Paris 8:30 p.m.
Heads-Up Online London vs. Berlin 11 p.m.
Aug. 18 Heads-Up Online Los Angeles vs. Montreal 7 p.m.
Heads-Up Online Sao Paulo vs. New York 9:30 p.m.
Heads-Up Online San Francisco vs. Las Vegas 12 a.m.
Aug. 23 6-Max Online Eurasia Conf. 6 p.m.
Aug. 24 Heads-Up Online Hong Kong vs. Berlin 6 p.m.
Heads-Up Online Moscow vs. Rome 8:30 p.m.
Aug. 25 Heads-Up Online Las Vegas vs. Sao Paulo 7 p.m.
Heads-Up Online Montreal vs. New York 9:30 p.m.
Heads-Up Online San Francisco vs. Los Angeles 12 a.m.
Aug. 30 6-Max Online Eurasia Conf. 6 p.m.
Aug. 31 Heads-Up Online Moscow vs. Hong Kong 6 p.m.
Heads-Up Online London vs. Paris 8:30 p.m.
Heads-Up Online Rome vs. Berlin 11 p.m.
Sept. 1 Heads-Up Online New York vs. Sao Paulo 7 p.m.
Sept. 6 6-Max Online Eurasia Conf. 6 p.m.
Sept. 7 Heads-Up Online Hong Kong vs. London 6 p.m.
Sept. 8 Heads-Up Online New York vs. Montreal 7 p.m.
Sept. 13 Heads-Up Online Hong Kong vs. Paris 6 p.m.
Sept. 14 Heads-Up Online London vs. Moscow 6 p.m.
Heads-Up Online Rome vs. Hong Kong 11 p.m.
Sept. 15 Heads-Up Online San Francisco vs. New York 7 p.m.
Sept. 20 Heads-Up Online Las Vegas vs. New York 7:00 p.m.
Heads-Up Online Los Angeles Montreal 9:30 p.m.
Heads-Up Online San Francisco vs. Sao Paulo 12 a.m.
Sept. 21 Heads-Up Online Berlin vs. Hong Kong 6 p.m.
Heads-Up Online Rome vs. London 8:30 p.m.
Sept. 22 Heads-Up Online Montreal vs. San Francisco 7 p.m.
Heads-Up Online Sao Paulo vs. Las Vegas 9:30 p.m.